Photo by Corey Fisher/Trout Unlimited Species of cold water fish such as salmon and trout, like this bull trout on the South Fork of the Flathead River in northwest Montana, face an increasingly uncertain future because of global warming. 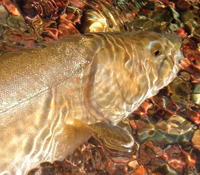 , A report released earlier this week indicates that migratory bull trout could decline by as much as 90 percent due to warming temperatures. Affordable unit dues too high? Think 30, the new ?Just Do It?